The RAS oncogene is mutated in 20% of all human cancers. Different types of mutations occur that promote cancer initiation and progression, yet we do not yet understand the specificity of how each mutation affects RAS’ ability to promote cancer. Unfortunately, despite decades of scientific effort, there are no effective therapies to directly target RAS mutant cancers. Dr. Burd proposes novel, mutation-specific studies of RAS in a variety of tumor types, starting with melanoma, thyroid cancer, and acute myeloid leukemia (AML). The reason why each cancer type appears to prefer one RAS mutant over another is unknown; however, she postulates that the subtle differences between mutants are critical for tumor formation. Her research will lead to new understanding of RAS mechanism and function, resulting in better design of novel therapeutics to target RAS for treatment of cancer. Project title: "Exploiting mutational specificity to target RAS-driven melanoma"
Dr. Chudnovskiy studies “antigen presentation,” an immune process by which dendritic cells capture antigens at the tumor site, migrate to the tumor-draining lymph nodes, and present tumor antigens to the effector CD4 and CD8 T cells that are responsible for anti-tumor responses. This is the first crucial step in successful cancer immunotherapy. Project title: "Defining dendritic cell-T cell interaction history within the tumor microenvironment using enzymatic labeling"
Immunotherapy has resulted in positive outcomes for patients with melanoma, lung cancer, and other malignancies; however, most patients do not have meaningful responses to this treatment strategy. Tumors that fail to respond to immunotherapy have effectively hidden themselves from detection by the host immune system. Understanding how cancers create an immune-excluded environment promises to lead to the development of more highly effective immunotherapies. Dendritic cells (DCs) play a central role in orchestrating the immune response to cancers by enabling T cells to “see” and destroy cancerous cells. Previous work has shown that melanomas secrete a protein called Wnt5a that potently suppresses DC function and ultimately contributes to the development of immunotherapy resistance. 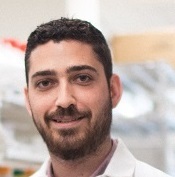 Dr. DeVito will examine certain tumor signaling pathways that have been implicated in driving Wnt5a production and facilitating cancer spreading by suppressing DC function within nearby draining lymph node tissues, which are critical for generating immune responses capable of destroying developing cancers. These studies will further investigate the ability of Wnt5a inhibition to sensitize cancers that are typically resistant to immunotherapy strategies. In addition, he is conducting a clinical trial to determine if the activation of these pathways correlates with immunotherapy failure in melanoma patients. 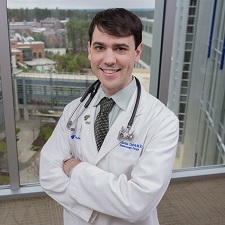 He anticipates that better characterization of pathways that cancers utilize to suppress DC function to thus shut down the immune response will lead to the discovery of novel, more effective immunotherapy strategies, and may identify biomarkers that will improve selection of tailored immunotherapies for specific cancer patients. 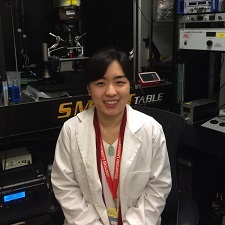 Project title: "Investigating the role of EMT-mediated dendritic cell tolerization in checkpoint inhibitor resistance"
Dr. Dong studies how injury and pathogen invasion trigger a chain of inflammatory and repair responses that restore the damaged tissue. Defects in wound repair result in painful, non-healing ulcers that frequently affect aged individuals and diabetes patients. Malignant tumors are particularly severe complications, which often occur at sites of repetitive irritation and chronic wounds. She is investigating the roles of anti-microbial peptides during inflammation and wound healing, and hopes that these studies will provide insights about the cause and prevention of various carcinomas. 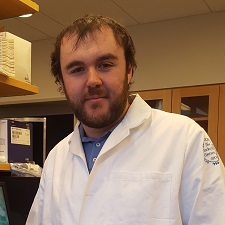 Project title: "Investigating ligand-receptor interactions between defensins and mrgprs in cutaneous inflammation and wound healing"
Dr. Insco studies advanced melanoma. Melanoma initiation and drug resistance rely heavily on factors that control gene expression. Proteins called Cyclin Dependent Kinases (CDKs) show promise as drug targets in multiple difficult-to-treat cancers and are enabling a method to “drug” the previously “undruggable” process of gene expression. 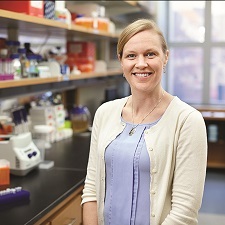 She aims to determine whether any of the transcriptional CDKs could be an effective drug target in advanced melanoma. Project title: "Investigating transcriptional cyclin dependent kinases as novel melanoma drug targets"
Dr. Kulalert focuses on how the skin is influenced by microbes. The skin is enriched with immune cells and highly innervated; nevertheless, the roles of neuroimmune crosstalk in cancer development and treatment remain largely unexplored. Sensory perception, especially pain sensation, is associated with cancer-related complications as well as chemotherapy. 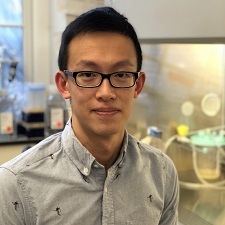 Because the microbiota plays a critical role in maintaining tissue homeostasis in the skin, he will explore whether sensory processing can also be modulated by the host-microbe interactions, particularly in the context of tumorigenesis and cancer treatment. These insights may provide novel tools to alleviate tumor progression and complications linked with cancer and chemotherapy, including pain sensation. 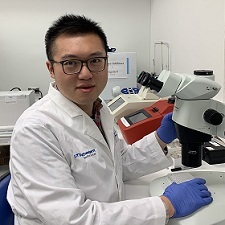 Project title: "Characterization of the microbiota-mediated cutaneous neuroimmune interface and its impacts on tumorgenesis and cancer therapy"
Dr. Li is focusing on the Hedgehog (Hh) signaling pathway, which is required for proper development during the formation of an embryo. This pathway can also be activated abnormally in adult tissue and has been implicated in multiple cancers—including basal cell carcinoma and medulloblastoma—that account for about 25% of cancer deaths. 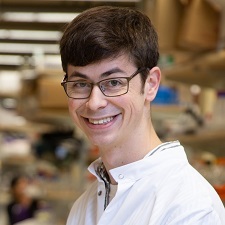 His lab will apply structural and cell biological approaches to study two major components of the Hedgehog signaling pathway: Patched-I, a tumor suppressor, and Smoothened, an oncoprotein. These results will broaden the understanding of the Hh pathway in cancer progression and may help identify potential targets for therapeutic intervention. Therapies that directly target cancer-promoting oncoproteins have revolutionized the treatment of cancer. Cancers, however, are primed to adapt and evolve in the presence of treatment, resulting in an ability to resume growth despite the presence of therapy. Utilizing cutting-edge new techniques that allow the determination of genetic alterations in single cancer cells, Piro aims to understand the principles that govern the evolution of resistance during therapy and identify novel therapeutic interventions that halt this process. His specific focus will be on resistance of lung cancer and melanoma to BRAF-targeted therapies. 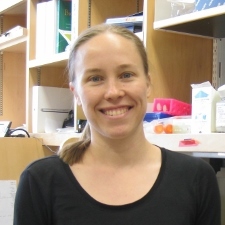 Project title: "Modeling the evolution of resistance to ERK signaling inhibitors at the single cell level"
Dr. Mann is investigating why the “killer” T cells of our immune system gradually lose the ability to recognize and kill cancer cells. Immunotherapy aims to revitalize these dysfunctional “exhausted” T cells, but a better understanding of how T cells recognize markers on cancer cells called antigens is needed. Dr. Mann is testing the response of engineered T cells to antigen stimulation at different durations, frequencies, and intensities. These studies will focus on understanding the role of calcium signaling in the failure of T cell response. Unraveling the molecular mechanism of T cell exhaustion may help in the design of therapies to prevent or alter its progression, potentially leading to improved immunotherapies. Project title: "Calcium signaling and the molecular clock of T cell exhaustion"